A survey conducted last year by job site Monster.co.uk found that more than half of British employees feel under appreciated at work. As we discussed in our article the 'Year of the Candidate'; research shows that employees are not as concerned about salaries. Most people want to be appreciated by the company they work for. It's worth noting that in this economic climate many businesses don’t have the funds to raise compensation levels. However, showing more appreciation to staff in other ways is a realistic approach for companies. In the United States, organisations nationwide have been celebrating the first Friday in March as Employee Appreciation Day since 1995, thanks to the pioneering work of Bob Nelson, an employee engagement guru and proponent of the power of recognition. There’s no reason Americans should have all the fun; it’s past time that the UK and Jersey has its very own holiday to recognise employee contributions. Companies can take the lead by setting aside a day to recognise all employees for being a vital part of the team, not only because greater appreciation levels will improve staff satisfaction but because it will increase engagement levels, resulting in better performance. Brits, and of course local employees, deserve recognition too. In Jersey we should we should acknowledge this day and the meaning behind it - it's important to recognise all the contributions local employees make to our economy. Companies now recognise the need to increase engagement levels with employees, and that can take a number of behaviours and support schemes. But once a year isn’t enough. We think companies now can offer ways to engage their employees not for just one day but rather an engagement programme that lasts all year long - every day can be Employee Appreciation Day. We already see many companies adopting this mindset by speaking up when an employee is performing well and giving sincere appreciation for work at its best and for actions that are aligned with the organisation’s goals and values. We see companies being a lot more socially engaged by staging social events outside the office and taking a team out for lunch during work time. Some companies reward employees with monetary vouchers or 'time vouchers' by giving an afternoon off. Time is a precious commodity which is often greatly appreciated. 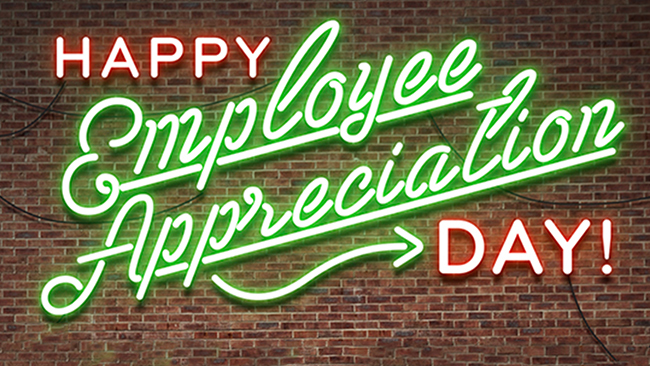 The whole crux of Employee Appreciation Day is to celebrate recognition and outstanding performance that is rewarded. This is underpinning of a thriving workplace culture. Sources: Forbes. Rob Catalano, VP, Global Expansion and Engagement at Achiever.